Leaving from Toronto, Tour Niagara falls by boat, plane, and bus. Your one-day experience of Niagara Falls includes transportation from Toronto Chelsea Hotel to Niagara Falls, as well as return to Toronto Chelsea Hotel. 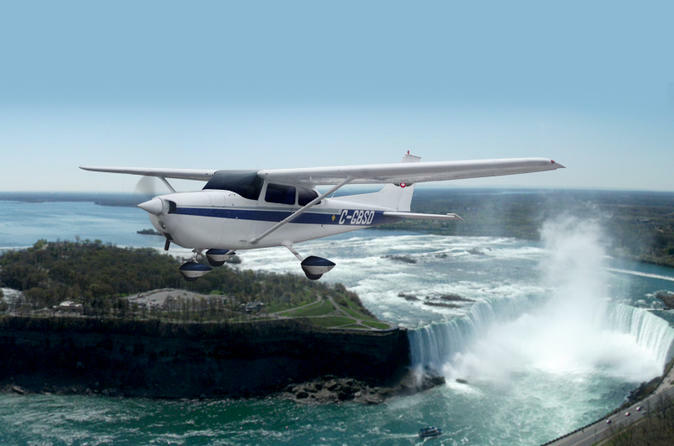 Take an airplane tour of the Niagara region in a Cessna Plane, where you'll journey low and slow for fantastic views and photos of Niagara Falls. Then shop and tour the beautiful Niagara-on-the-Lake, voted Canada's prettiest town. Board the world famous Maid of the Mist for a boat ride in Niagara Falls. Shop for souvenirs at Niagara Falls Table Rock Welcome Center. Lastly, enjoy a unique wine tasting experience at an exclusive bio-dynamic organic winery. Your all-day tour tour includes everything except shopping and food. First, depart at 7am from Toronto Chelsea Hotel. This is a super easy location to find, located at the corner of Yonge Street and Gerrard, and accessible by bus and subway. Meet in the lobby at the Airline Crew Check In Desk. Then jump onto an air conditioned Wi-Fi equipped bus with chargers for Android, Blackberry and iPhone. Sit back and enjoy the 75-minute ride to Niagara. From 8:30am to 10am, you'll take an airplane tour of the Niagara region. Experience the power of Niagara Falls, the engineering marvel of the Welland Canal, all within the comfy confines of a charter airplane. This scenic and thrilling narrated airplane tour makes for a great introduction to the Niagara region, from a Bird's Eye View. Soar over the Niagara region as you learn the history of Niagara-on-the-Lake and the centuries old Fort George and Fort Niagara. You'll also visit the Falls at low altitude - up close and low! From 11am to 1pm, shop and enjoy lunch (at own expense) in beautiful Niagara-on-the-Lake. Canada's first capital city is home to historic sites, the George Bernard Shaw Festival Theatre, and many fine wineries. Stroll down the main street and shop at unique stores along the main route. Check out the fancy food and fun filled pubs, restaurants, and patios overlooking Lake Ontario, with Toronto in the distance across the lake. At 1:30pm, jump aboard the Maid of the Mist Hornbower Boat Ride at Niagara Falls and visit Table Rock Niagara Falls. The entire boat trip is taken up to the Falls, as they crash around you on this wonderful ride. Following the boat ride, stroll towards Niagara Falls and photograph the rainbows created by the mist of the Falls. At 4pm, enjoy a 60-minute winery tour and tasting at an exclusive bio-dynamic organic winery, including Ice Wine. Much more than just a winery tour, this experience is a glimpse into the future of farming, and sustainable food and wine production. As the tour comes to an end, begin your return trip to Toronto Chelsea Hotel at 5pm. Sit back and relax and leave the driving to your guide. Your package includes transportation, entry fees, parking, plane tour, boat tour, and a wine tasting. This tour is designed for those wishing to experience the awe-inspiring power and beauty of Niagara Falls, and the fresh air of beautiful Niagara-on-the-Lake and the surrounding Region.